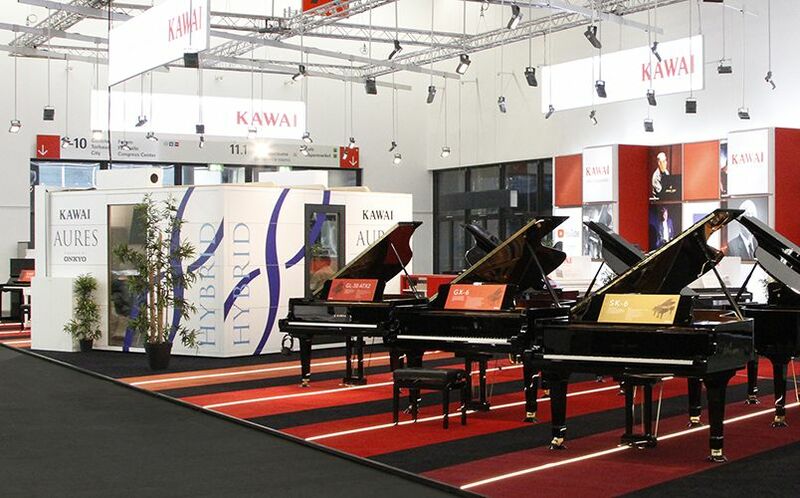 Kawai is proud to announce that a new hybrid upright piano instrument, named AURES, will be previewed to the public at the Musikmesse exhibition held in Frankfurt, Germany from 11th~14th April. AURES – blending AUDIO and RESONANCE – instruments are equipped with a newly developed resonance system that allows the soundboard of a Kawai K series upright piano to also deliver digital audio, such as commercially available music, or the sound of other musical instruments, without the aid of additional speakers. The AURES’ unique soundboard technology has been developed in collaboration with Japan’s leading premium audio manufacturer, Onkyo, and incorporates newly-designed high performance transducer components that transmit energy more efficiently than conventional parts. The resulting sound produced entirely by the soundboard is rich, powerful, and expansive, and enhanced by the unique harmonic properties of solid spruce wood. In addition to previewing AURES, Kawai will also exhibit a selection of professional acoustic grand and upright pianos, the NOVUS NV10 hybrid digital piano, and a full range of digital instruments including the latest Concert Artist series and MP stage pianos. Musikmesse visitors can experience the AURES in person at a special exhibit in Hall 11.0 booth A88 from 11th~14th April. Kawai Japan has issued a software update for the CN37 Digital Piano. This recommended v1.05 update addresses some issues relative to received MIDI data, while also fixing random playback when using the USB player. – Fixed: Bug related to random playback mode when using the USB player. – Fixed: MIDI IN chorus send level and chorus parameters would not work correctly. – Changed: Volume, pan, and expression commands received via MIDI IN no longer affect the keyboard sound. – Improved: Support for Virtual Technician iPad app Smart Mode, User Touch Curve, and User Voicing functions. – Fixed: Sometimes changing sounds using the Sound Museum app would not work correctly. – Fixed: Sometimes the display would not update when using the Sound Museum app to change settings. – Improved: Key-off noise character of electric piano sounds. CN37 owners are encouraged to update their instruments to use this latest software version. We also recommend that users backup any user-created Registration/Startup settings before applying the update. Note that Kawai software updates are cumulative, i.e. the v1.05 update includes any fixes and improvements provided with all previous versions. Kawai Japan is proud to announce the CA58 digital piano, the latest addition to the popular Concert Artist series of digital pianos, and the fourth model of the ‘8 series’ range. This attractive instrument combines Kawai’s new Grand Feel Compact wooden-key keyboard action and Harmonic Imaging XL sound engine, featuring Shigeru Kawai SK-EX and Kawai EX concert grand piano sounds, while also boasting built-in Bluetooth® wireless connectivity, a powerful 4-speaker 100W output system, and a premium quality cabinet design, delivering best-in-class touch, tone, and features at an outstanding price. 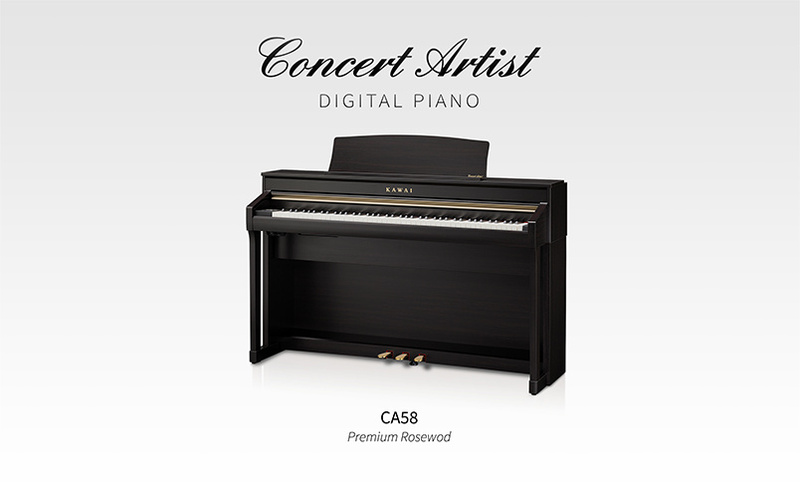 The CA58 is the latest Kawai digital piano to utilise the new Grand Feel Compact wooden-key keyboard action. As its name suggest, the GF Compact action has been designed to reproduce the authentic touch weight characteristics of the industry-leading Grand Feel keyboard actions, within a smaller form factor. The new action retains the long wooden keysticks used for all 88 black and white keys, and the familiar seesaw mechanism employed by acoustic grand piano actions for centuries. However, despite its smaller unit size, GF Compact features an extended key pivot length, providing a more consistent touch weight when playing towards the rear of the keyboard. This crucial detail ensures the new CA58 delivers the most realistic playing experience in its class, surpassing even the venerable RM3 Grand actions utilised by some of Kawai’s best-selling Concert Artist models. As with all modern wooden-key Kawai actions, Grand Feel Compact incorporates grade-weighted hammers, bass region counterweights, and let-off simulation for added authenticity, while its accurate triple-sensor key detection system allows rapidly repeated notes such as trills to be performed smoothly, without unnatural breaks in sound. The rich, expressive sound of Kawai’s celebrated grand pianos are at the heart of the new CA58 digital piano, with two world-class instruments lovingly recorded and faithfully produced using full 88-key stereo sampling: the flagship Shigeru Kawai SK-EX, and the highly-acclaimed Kawai EX. With two distinctive Kawai grand pianos and even a traditional upright readily available, CA58 players can explore a variety of different piano sounds, and enjoy the contrasting properties of each. The new CA58 utilises Kawai’s advanced Harmonic Imaging XL technology, incorporating extra-long sampling and algorithms that reproduce how an acoustic piano’s tonal character changes as dynamics increase. This ensures seamless expression when playing from gentle pianissimo to thunderous fortissimo, without sudden changes in sound. And with an impressive 256 note polyphony, professional players need never worry about held notes ‘dropping out’ unexpectedly during more complicated passages. The impressive CA58 offers a variety of useful features to complement its authentic wooden-key touch and stunning grand piano sounds. Integrated Bluetooth MIDI allows the instruments to communicate with supported smart devices, using Kawai’s Sound Museum and Virtual Technician apps to select and adjust sounds wirelessly, while the built-in lesson function (featuring a variety of classical etudes and Alfred songs), adjustable metronome and song recorder, are invaluable tools for aspiring pianists. An assortment of additional instrumental voices, combined with the Dual playing mode adds greater variety to players’ performances, while the special Four Hands mode divides the keyboard into two independent sections, allowing teacher and student to practise and play together using a single instrument. Kawai’s advanced SHS technology is also included, enhancing the depth and realism of sounds heard through headphones or earphones, while also helping to reduce auditory fatigue when listening for extended periods of time. The CA58’s powerful recorder function allows MP3 and WAV audio and MIDI song files stored on a USB memory device to be played back through the instrument’s high fidelity 100W 4-speaker output system, or for performances to be recorded, overdubbed, and shared with friends and family online. The fully-featured Concert Artist includes USB-MIDI and standard MIDI connectors for flexibility with computers and other devices, and also offers stereo Line In and Line Out jacks that allow the instrument to be enjoyed in larger settings such as churches or school halls. The CA58 is housed within a premium quality wooden cabinet that incorporate a flat fascia and raised upper board, giving this instrument a classic, upright piano-like character. The Concert Artist’s broad music rest is engineered to accommodate the most ambitious musical works, with a high-quality surface and attractive round design. As with a grand piano, the viewing angle of the instrument’s music rest can be adjusted to suit the performer’s playing position, or laid flat for convenience when notating scores or sketching musical ideas. The CA58 is available in three attractive cabinet finishes: Premium Rosewood, Premium Satin Black, and Premium Satin White, allowing musicians to coordinate their piano with a range of traditional or modern interiors. A superb wooden-key keyboard action, stunning grand piano sounds, and a variety of modern, convenient features – all housed within an attractive and inspiring cabinet. Introducing the Kawai CA58: Best-in-class touch, tone, and features at an outstanding price. Kawai Japan is delighted to announce the KDP110 digital piano, the latest addition to the affordable KDP series of digital pianos, and the successor to the extremely popular KDP90. This updated model incorporates the new Responsive Hammer Compact II keyboard action, superb Shigeru Kawai SK-EX grand piano sounds with Virtual Technician customisation, flexible Bluetooth® MIDI, USB-MIDI, and standard MIDI connectivity, SHS headphone enhancements, and a more powerful amplifier/speaker system, to deliver an exceptional introduction to Kawai digital piano quality at an affordable price. 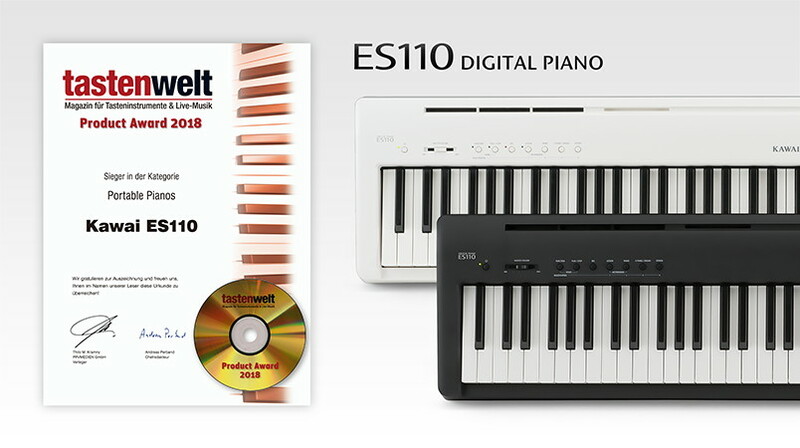 The KDP110 is the first Kawai digital piano to utilise the new, improved Responsive Hammer Compact II weighted key keyboard action. The RHCII action retains the same realistic graded hammer weighting, structural rigidity, and low-noise characteristics of its highly regarded predecessor (introduced with the ES110 last year), while adding triple sensor hammer detection. Unlike most instruments in its class that generate sounds based on key velocity, the KDP110’s realistic keyboard action design measures the velocity of the weighted hammers that are thrown when playing each key. This preferred method reproduces the mechanism of an acoustic grand piano more accurately, and allows performers to play with a greater range of musical expression. The RHCII action’s added third sensor improves responsiveness when playing the same key repeatedly, and unlike conventional two sensor keyboard actions found in many digital pianos, enables the sound of a single note to be gradually ‘layered’ without the previous tone being lost. Moreover, Kawai’s action technology also monitors hammer velocity when each key is lifted, influencing the release character of piano sounds, and providing a greater range of expression between staccato and legato playing. Connected to this responsive keyboard action is the rich, expressive sound of Kawai’s celebrated Shigeru Kawai SK-EX concert grand piano – widely regarded by professional pianists and piano technicians as one of the finest instruments within its class. All 88 keys of this exceptional instrument have been meticulously recorded, analysed and faithfully reproduced as high-fidelity digital waveforms. Recording each key individually in this way preserves the rich harmonic character of the SK-EX concert grand piano, and guarantees that the sound heard when playing any one of the KDP110’s weighted keys is an accurate representation of the original acoustic source. Kawai’s advanced Harmonic Imaging sound technology ensures seamless expression when playing from gentle pianissimo to thunderous fortissimo, without sudden changes in sound, while the impressive 192 note polyphony allows complicated passages that utilise the damper pedal to be enjoyed without notes ‘dropping out’ unexpectedly. 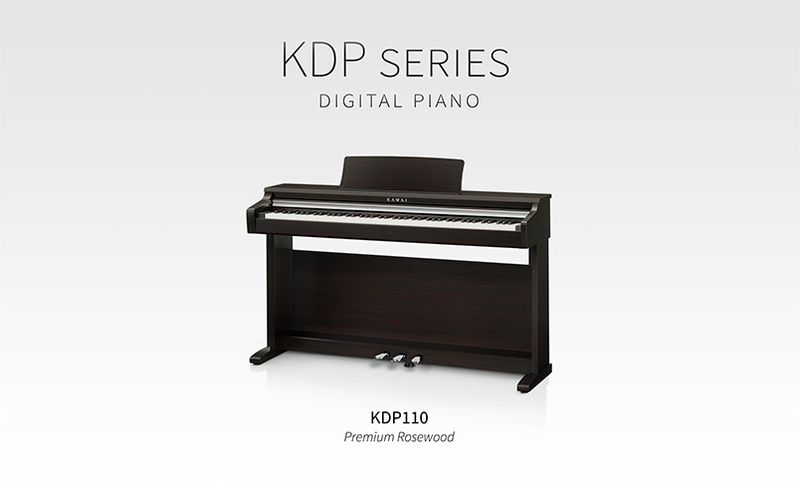 The KDP110 offers a variety of useful features to complement its realistic weighted-key touch and authentic grand piano sounds. Integrated Bluetooth® MIDI allows the instrument to communicate with supported smart devices, using Kawai’s Sound Museum and Virtual Technician apps to select and adjust sounds wirelessly, while the built-in lesson function (featuring a variety of classical etudes and Alfred songs), adjustable metronome and song recorder, are invaluable tools for aspiring pianists. An assortment of additional instrumental voices, combined with the Dual playing mode adds greater variety to players’ performances, while the special Four Hands mode divides the keyboard into two independent sections, allowing teacher and student to practise and play together using a single instrument. The KDP110 features an upgraded amplifier and speaker system, and also includes Kawai’s advanced Spatial Headphone Sound (SHS) technology, which enhancing the depth and realism of sounds heard through headphones or earphones, while also helping to reduce auditory fatigue when listening for extended periods of time. The KDP110 is housed within an attractive, compact wooden cabinet that incorporates a wide, fold-down music rest and sliding keyboard cover. The instrument’s high quality Premium Rosewood finish with silver fittings ensures this impressive digital piano is suitable for a range of traditional and modern interiors. A new, improved keyboard weighted-key keyboard action, stunning Shigeru Kawai grand piano sounds, and a variety of modern, convenient features – all housed within an attractive compact cabinet. Announcing the KDP110: An exceptional introduction to Kawai digital piano quality at an affordable price.